The Storm skill tree is a Wizard skill tree that focus on traditional elemental attacks, like the sorceress of Diablo II. Skills - General skill design and mechanics. Wizard skills - Wizard-specific skill design. Conjuring Skill Tree - Conjuring skills. Arcane Skill Tree - Arcane skills. Storm Skill Tree - Storm skills. Wizard skill archive - Removed Wizard skills. 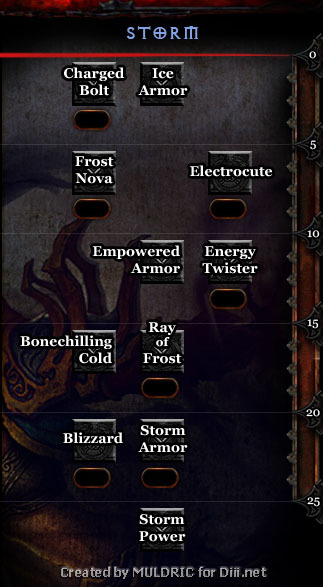 Storm Skill Tree is an archived article about material previously included in Diablo 3. However, it has been removed or the article contains outdated facts. The information is stored in Diablo Wiki for posterity. Please note: Links in this article lead to both updated and archived material. Wizard's Storm skill tree as of BlizzCon 2009. Spells that bring in the cold air from the stratosphere, or brings forth lightning bolts flung at enemies. A field of ice slows movement and attack speed of enemies that attack you at close range, and causes X cold damage. An explosion of ice pelts nearby enemies for X-Y cold damage. Has an additional Z% chance of a critical hit. Lightning arcs from the Wizard’s fingertips towards an enemy, electrocuting it for X-Y lightning damage. Increases your armor by X%. Summon an Energy Twister that deals 10 damage per second to everything in its path. Project a beam of cold energy that deals X cold damage per second. Call down shards of ice to pelt an area dealing X-Y cold damage per second for 3 seconds. Surround yourself in electrical energy. Electric bolts are automatically fired at attackers for X to Y damage. Armor spells affect you and all nearby allies and you can only be affected by one armor spell at a time. Increase damage of all lightning and ice spells. This page was last edited on 3 May 2012, at 03:59.